The LippyClip Lip Balm Holder for Chapstick, Blistex, etc. (Lavender and Gold Roses) by Gabriel's Good Tidings® at Diaper Bags Coach. Hurry! Limited time offer. Offer valid only while supplies last. REDUCE WASTE - NEVER LOSE YOUR LIP BALM AGAIN! Perfectly holds all standard size lip balm such as Chapstick, Blistex, etc, and keeps them right where you can see them. For once in your life, completely finish a tube of lip balm! HANDMADE IN THE USA! The LippyClip is proudly handmade in America by women working from home. We've intentionally kept our brand American made to give women the opportunity to supplement their families' income by mastering a craft. FAST SHIPPING! Via Amazon Prime or fulfilled by our shipping service. Orders shipped outside of Amazon Prime typically ship the same or next business day. The LippyClip should arrive to your mailbox 2-5 days from your order date. CLIP AND GO! 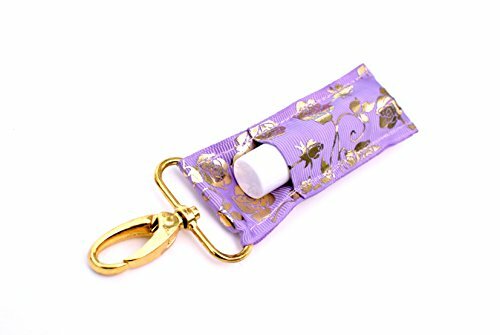 The LippyClip is a convenient, stylish accessory that attaches easily to your keyring, purse hardware, backpack, diaper bag and more. Clip it anywhere you choose to have your lip balm always accessible. GIFT-READY PACKAGING! Each LippyClip is individually packaged with a branded hangtag and clear bag, ready for you to give as a perfect birthday, Mother's Day, Father's Day, Christmas, or Valentine's holiday gift. Styles for boys, girls, men, and women to suit any taste! If you have any questions about this product by Gabriel's Good Tidings®, contact us by completing and submitting the form below. If you are looking for a specif part number, please include it with your message.